Chicken with creole cream sauce on a bed of green chili, garlic mashed potatoes. It takes a rustic cajun dish up a couple notches. From down and dirty stew to dinner party. Don’t get me wrong. I love a creole chicken stew. It’s comfort food with spice. But sometimes upscale is the way to go. This dish takes the basic creole flavours and refines them a bit. I’ve dropped the celery from the cajun holy trinity of green pepper, onion and celery. Celery tends to be hard to puree. Has that stringy texture that has no place in this dish. Something lost in flavour. Something gained in texture. This dish isn’t light on flavour so it’s a pretty good trade. 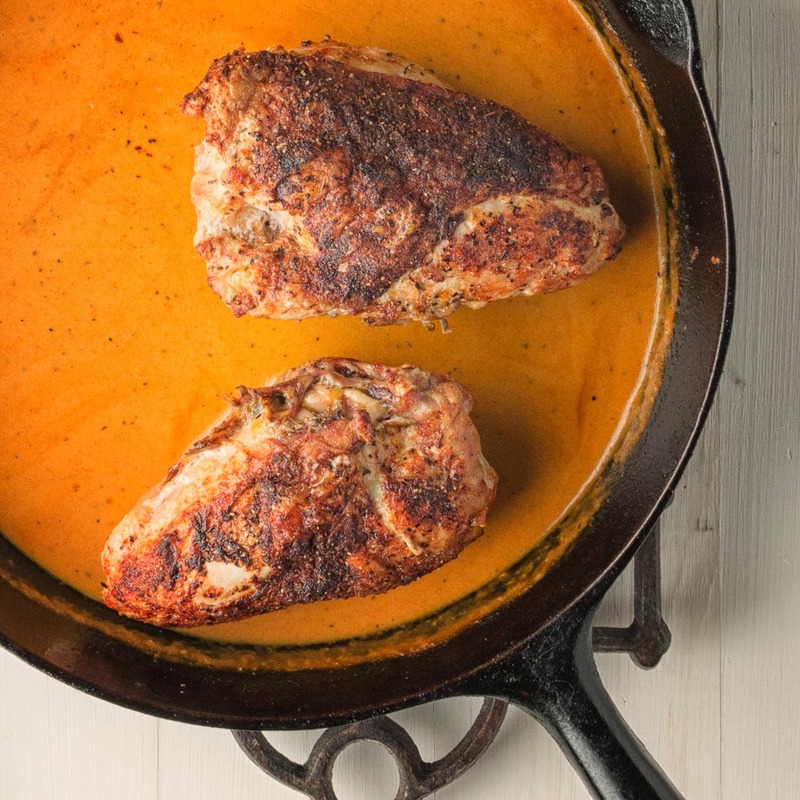 The one thing that is absolutely critical if you make this chicken with creole cream sauce as written is that you cannot use pre-fab, high salt creole seasoning. The dish will turn out way too salty. You can adjust salt up. That’s easy. You cannot adjust salt down. That’s impossible. Make your own low salt creole seasoning. Or dial the creole seasoning way back and be disappointed. Pureeing the sauce before adding the cream takes a rustic cajun dish into fine dining territory. Cook the onion and green pepper for about 5-7 minutes, until the onion is translucent and the pepper has started to soften. Add the creole seasoning and cook another minute or two. Add the garlic and cook one more minute. Add the tomato and cook one minute more. Add the chicken stock and simmer, covered, over low heat for about 20 minutes or until the green pepper is tender. Allow to cool briefly and puree in a blender until smooth. Pre-heat your oven to 400F. Pre-heat a frying pan over medium heat. Season chicken with creole seasoning. Add oil. When it shimmers, add the chicken and sear, skin side down until just golden - about 2 minutes. Spoon off fat, turn the chicken skin side up and roast to an internal temperature of 165F - about 30-35 minutes. Remove chicken from the oven. Set the chicken aside, tented with foil. Deglaze the pan with a splash of chicken stock. Add the pureed sauce and cook, stirring constantly for about a minute. Add a bit of stock if the sauce is too thick. Add the heavy cream and stir to combine. Adjust seasoning. To serve, mound green chili mash in the middle of the plate. Spoon sauce around and top with the chicken breast. Cook 4 large Yukon gold (yellow flesh mashing) potatoes in well salted water along with 3-4 cloves garlic. Blister and char one or two poblano peppers under the broiler. Peel and seed. Chop finely. Mash potatoes and garlic as you usually do with butter and hot milk. Add chopped, roasted poblano peppers and stir to combine. Adjust seasoning. This sauce sounds AH-MAZING. I love everything about this dish and can’t wait to try it! 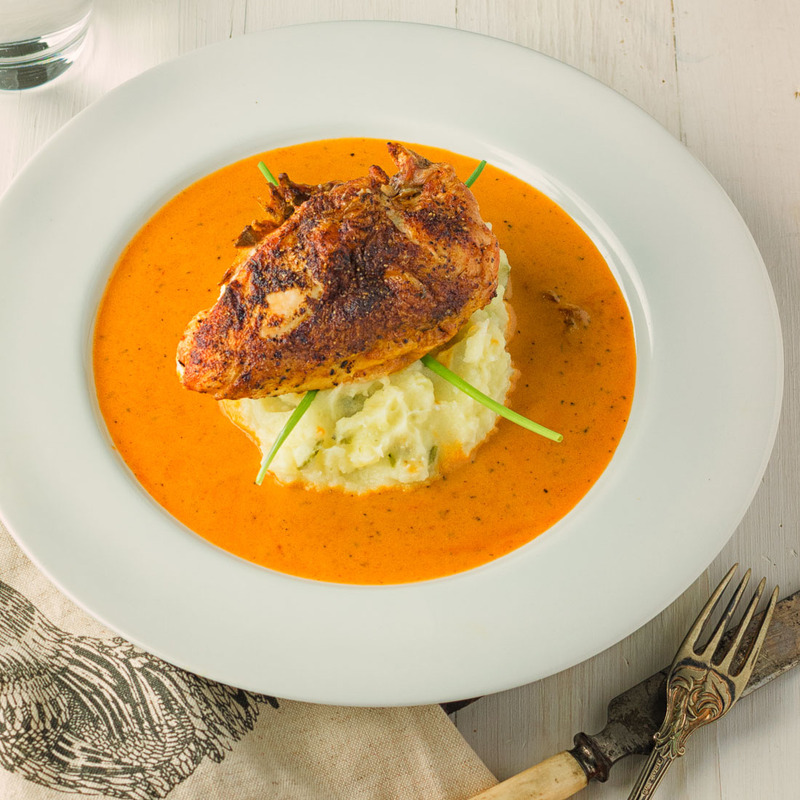 Spicy mash potatoes and a creamy creole sauce! Such a clever ideas with such an interesting flavours that I would have never thought of! I will need to give this a go. Oh! I totally agree, homemade spice mixes are a must, such a easy thing to do that allows proper salt adjustments. Mashed potatoes are fun. You can mix in all sorts of different flavours depending on what you are serving them with. That chicken looks fabulous! And I love roasted poblanos, but have never thought to add them to mashed potatoes. This is my kind of dish! Can’t wait to try this one. Poblanos – doesn’t seem to matter what you throw them at – it just works. Hope you like it. Thanks. I’m glad you liked it and thought it would be good enough for a birthday dinner. The sauce sounds so delicious and I’ve never tried poblano peppers in mashed potatoes before! I can’t wait to try this! Thanks! Hope you like it. If you don’t have poblano peppers the chicken is great on regular mashed. I cook A LOT of chicken and I’m always looking for new ways to do it! Can’t wait to try this recipe out. I also love making my own seasonings so I’ll be making your creole seasoning as well! Pinning for later, thanks for sharing! This looks sooo good!! Love the vibrant colored sauce. Anything that mixes tomato and cream is a winner in my book. Plus the creole seasoning sounds amazing! Can’t wait to make this! The creole seasoning is the key. It’s a low salt mix so you can really pile it on to drive up the other flavours without worrying about the final dish coming out too salty. I’m so glad you liked it. I was trying to figure out what to make for dinner today myself and thanks to your comment I am having this. Thanks for reminding me! When do you add the heavy cream? I didn’t see that in the sauce instructions. The cream goes in after you deglaze the pan. See the finishing step. What veggie would pair well with this? Do you think a wilted spinach could be added to the sauce after its plated? Spinach on the plate sounds great. Braised leeks would work as well.